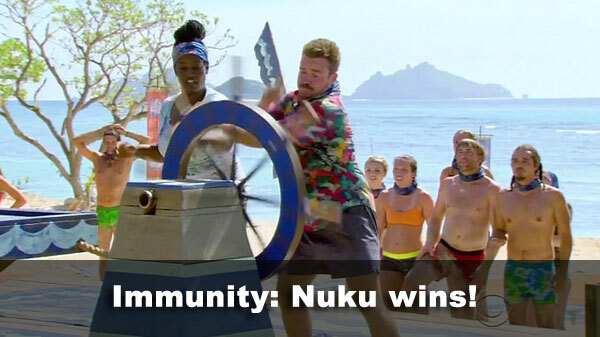 "The Stakes Have Been Raised (Part 1)"
Ep1 Reward/Immunity challenge: "Blue Lagoon Bustle" - Nuku blows Mana out of the water, the locks, and the puzzle. 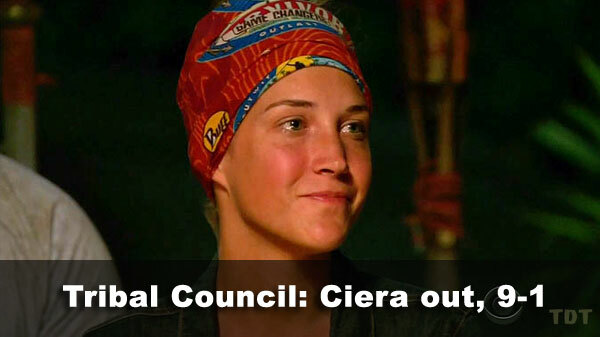 Ep1 voted out: Ciera, 9-1 over Michaela. Caleb Reynolds finally attended his first Tribal Council. Yay? - Ciera received 9 votes, from Aubry, Caleb, Hali, Malcolm, Michaela, Sandra, Tony, Troyzan, and Varner (voted out, 9-1). - Michaela received 1 vote, from Ciera.